This week’s miscellany post could almost be relabeled “end-of-season inverts”, as most of the photos are of this group of critters. November is the month where winter finally seems to be taking hold: the trees are barren and gray, the meadow grasses are dried and dead, temperatures are falling, there’s often frost at dawn. And yet, even in the face of winter, thumbing their proverbial noses at it, the last remaining ambassadors of summer, insects and arachnids and other invertebrates, still come out in the afternoons. 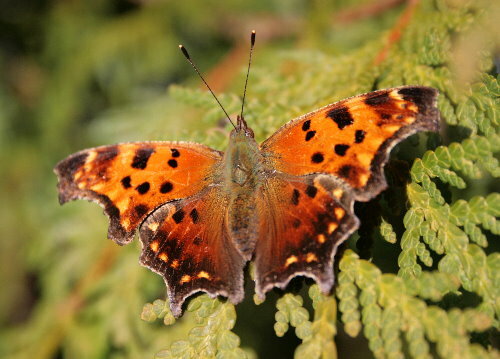 Just yesterday this lovely Eastern Comma flitted across my path as Raven and I left the house to head out into the fields. It alighted on a sun-bathed cedar branch and spread its wings to soak up the warm rays. It’s like he came to bid me good night, see you next year! It won’t be long before all of these guys have found a snug place to sleep out the winter. As the snow begins to melt in March and the earth begins to warm again we’ll start to see them on the wing again, perhaps a little worn, but a refreshing sight nonetheless after months of cold and snow. I’ve been searching tree trunks recently looking for a particular species of moth whose females are flightless and can sometimes be found on trees during the mating season. So far I haven’t located any, but while I was searching I came across this guy. It’s an Autumnal Moth, a cold-hardy species that’s found across much of the north. 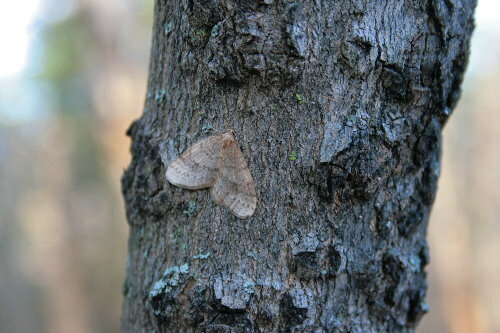 In addition to getting them coming to my lights at night, I’ve also seen them fluttering through the forest during the daylight hours, occasionally alighting on trees. I found this one by chance, though if one were to follow the dancing flight of a dayflying moth it would come to rest for observation eventually. I mentioned a couple of posts ago how Dan brings me the most thoughtful gifts. This was his latest offering, a large, chunky caterpillar that he’d found climbing up the side of the porch steps. I’d seen these guys before at the lake house and so knew what it was: the caterpillar of the Giant Leopard Moth (I’d also caught the adults at my lights in June, photo here). I was a bit surprised to discover the species here at the new house; I had actually just mapped the range for the species for the guide that afternoon, so it was fresh in my mind. Giant Leopards are a more southern species, with their range just sneaking into Ontario in the Carolinian zones along Lake Erie and at the western corner of Lake Ontario. The Carolinian region here in eastern Ontario extends from Kingston on Lake Ontario north into the edge of the Shield along the Frontenac Arch, which includes Frontenac Provincial Park (which we lived across from). Although we’re only about 35 km from our last house, as the crow flies, the habitat around here feels different and I thought that we were outside of that Carolinian zone. But maybe not? Or maybe the species comes a bit farther north than the data I have indicates? As a segue onto non-Lepidopterans, this spider turned up in my moth trap one night. I do get the occasional spider in the trap (one smart thinker actually built a web in the funnel and caught a moth), but this is the first time I’d seen one of these guys there. 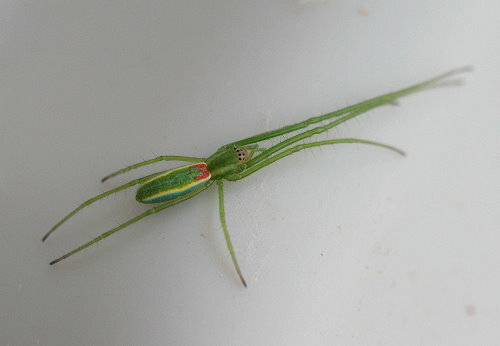 It’s a longjawed orbweaver (family Tetragnathidae), specifically Tetragnatha viridis. Members of the genus Tetragnatha are often seen stretched out on long, narrow foliage such as grass blades or goldenrod leaves, their long front legs extended ahead of them, parallel to the leaf. Apparently it also has the ability to skitter over water surfaces like a water strider. There are hundreds of species in this genus, found around the world. Tetragnatha roughly translates to “four jaws”, which presumably refers to the oversized mandibles of some species. Even now, at the fringe of winter, there are still grasshoppers that bound off the path through the meadows as Raven and I walk through. I don’t know what the species of this one is, though I might guess it to be a member of the genus Melanoplus, such as a couple of the ones I found back in Grasshopper Season. I don’t know if it was because the air temperature wasn’t all that warm even by mid-afternoon, or if they’re just getting sluggish with the approach of winter, but compared to the skittish individuals back in September these ones were exceptionally obliging, allowing me to move grass blades just inches from their heads out of the way of the shot. The final insect of the post, this ground beetle, or what I presume to be a ground beetle, was attracted to the porch light one evening last week. Despite the purplish sheen to the elytra, it was difficult to pin down an identification to this one, too. My guess might be Calosoma sp., a group of ground beetles predatory on caterpillars, but I find the all-black beetles a challenge to figure out. At the back of our fields is a narrow stretch of boggy forest, full of sphagnum moss, cedar and tamarack, the only place I can recall seeing tamarack on our property. It seems to be a species often associated with wet or boggy habitats (although I know of a couple growing in my parents’ new backyard, which is dry). It’s a unique type of tree, looking for all the world like an evergreen until fall rolls around and its needles all turn yellow and fall off. One who didn’t know better might be alarmed for the health of the tree. Of course, this begs the question of why does it do it? Conifers have evolved exceptionally thin, waxy leaves (needles) specifically so that they wouldn’t need to drop them in the winter (the shape helps them to retain water, and they don’t become as heavy when covered with snow as a deciduous tree would). The reason relates to snow. Most conifers tend to develop very strong limbs to help them support the weight of snow collecting on the branches (they still collect more than a bare deciduous tree) in exchange for being able to keep most of their leaves and not have to invest energy in regrowing them each year. However, tamaracks have relatively weak limbs, and if they retained their needles the weight of the snow would snap them (compared to the equivalent situation in a spruce, whose limbs are stronger and can support the snow). The tamaracks have shifted where they invest their energy – instead of building strong, sturdy limbs, they have opted instead to regrow their leaves each year. 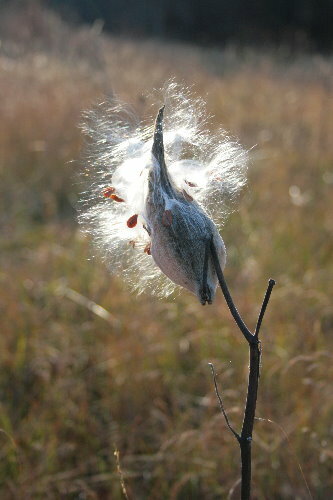 Most of the milkweed pods in the fields have opened up now, spreading their seeds to the wind. As the sun gets low early in the afternoon at this time of year the puffs of seeds seem to glow with the backlighting, radiant blooms of fairy hair. Backlighting makes for some wonderful photographs in the meadow, and I took a number while I was out with Raven. I thought I’d try getting a photo of the path leading back to the hedgerow, the grass all golden in the sunlight. Raven rarely misses an opportunity to be in a photo, particularly if you’re taking the photo from ground level. As soon as she spotted me kneeling (to try to get a better angle), she came racing up the trail, ears flapping, tongue glowing, eyes bright. Is tamarack also called “larch”? 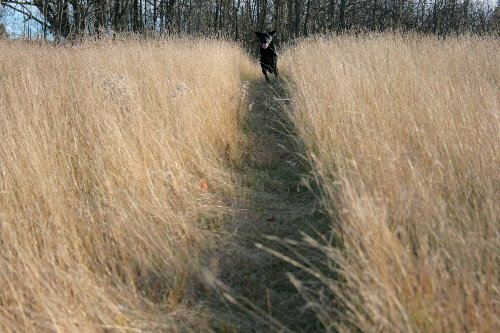 Love, LOVE the doggie trail (and doggie, of course). Love your blog. Thanks, Gayle, glad to have you swing by! Yes, tamarack is also known as larch; I think larch actually refers to a group of trees (the same as ‘maple’) and the tamarack is the only species of larch in North America, so it’s often just referred to by its group name. Generally, the “Caterpillar Hunter” has predominately green elytra with nothing more than hints of ebony. That said, I believe your find to be a European Ground Beetle (Carabus nemoralis), whose entirely black body and slightly broad prothorax closely mirrors that photograph. Thanks, Mature4evr – I figured it probably wasn’t the same species, but beetles always give me trouble. Eric Eaton (the author of the Kaufman insect guide) also left a comment with a suggestion – one of the great things about the blog, if you don’t know what it is, post it up and one of your readers surely will! I hear ya. That you could even make a suggestion, though, is far beyond my capabilities! I rifle through the field guide and see if anything looks remotely similar, and after half an hour of puzzling rarely get much closer than a “maybe-possibly-who-knows” ID. Love the pictures of Raven. Thanks, Grammarian, she’s a real character. The photos of Raven are pure and delightful fun! 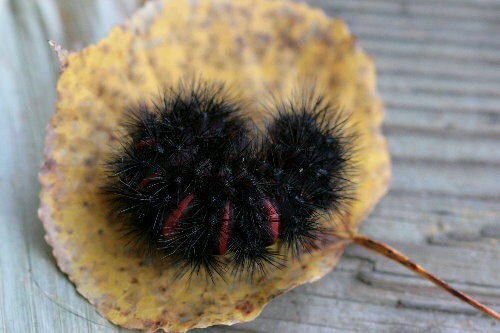 The leopard moth caterpillar is beautiful. 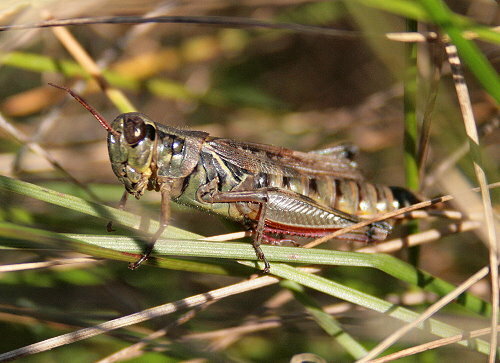 Truly one of my favorite insects–as children and as adults. The tamarack is stunning! It first made me think of the bald cypress we have here, another conifer that loses its leaves in autumn. 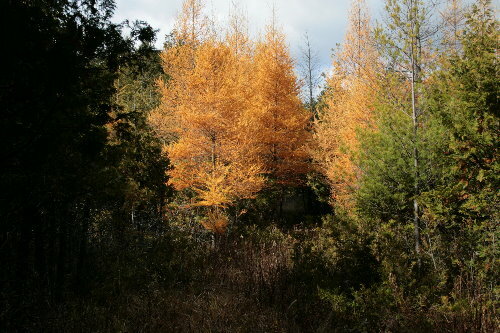 It turns a warm orange to orange-brown, nothing quite so vibrant as the tamarack. What a marvelous view! Thanks, Jason! I believe the Bald Cypress is the only other North American conifer that loses its needles, and is the southern counterpart to our northern larch. 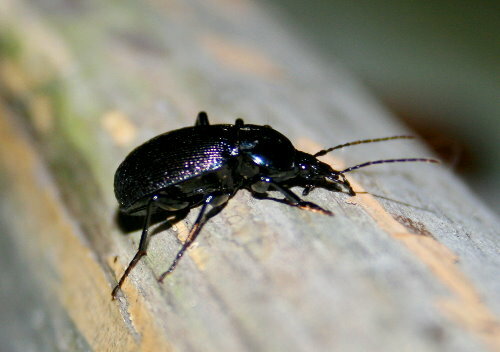 Hi, Seabrooke: Great post as usual:-) I am pretty certain your ground beetle is something in the genus Sphaeroderus, which are snail-eaters. Great images!